Made-to-measure cocktails in a trendy dusky pink bar. What should I drink? Pick your poison and let the bartenders design it your way. 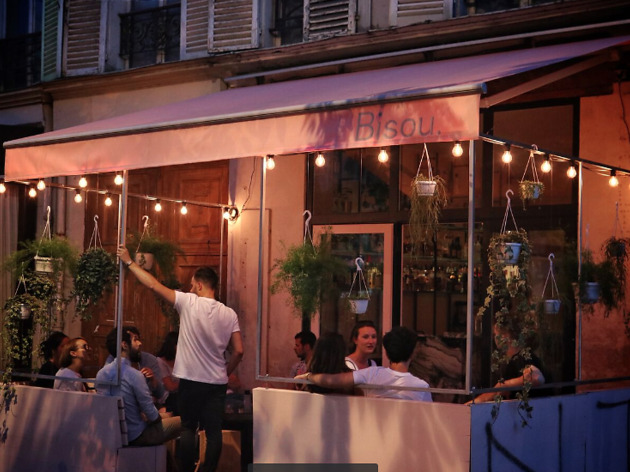 A few strides away from the bustling Rue Oberkampf, on Boulevard du Temple, is the eye-catching bar Bisou. There’s no menu, but behind the sublime marble bar is mixologist Nicolas who, with just a word in the right direction, will shake up a concoction to suit your fancies (€12 a pop). After mentioning mezcal and bitterness, he whipped up a concoction of mezcal, Dolin white vermouth, Suze, sherry, chocolate bitters and sesame oil. It’s simply exquisite. Small plates of hummus and tapenade go down a treat too. 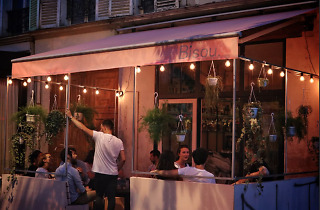 Not only are cocktails high-flying, but Bisou is also taking a sustainable approach and only working with 100% organic locally sourced products. Waste products are also recycled as cocktail garnishes. The outdoor area is a highlight – a pink pastel awning and hanging plants make it the perfect romantic date spot.